Based on the Greenspot Nomad Jacket our Greenspot® DV Heritage Jacket is ideal for touring cyclists who want to replicate the 1950's era. 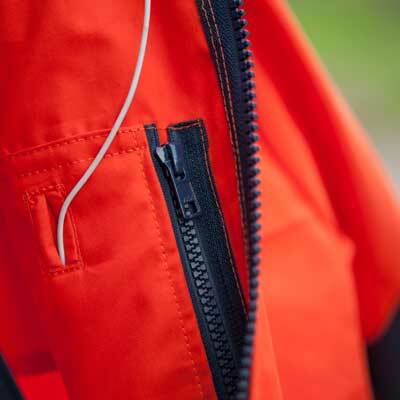 It is fully waterproof and has a range of features in keeping with the original jacket. Angled front pockets give accessibility on the move and an inner pocket can be used for further storage. Side tabs enable the waist to be adjusted. Also take a look at our other Greenspot® jackets: the Greenspot® DV and the Greenspot® SV Light. I have yet to wear it, but it certainly looks good. I had many Greenspot jackets back in the day. Sizing is on the generous side which works because I intend this to be a winter jacket, so there is room for jumpers etc. Communication by email was timely and friendly. Roll on the winter when I can wear this jacket. My first Ventile jacket came from Black's of Greenock in 1970. This one is of two-layer Ventile. The jacket suits me just right; I ordered it with slightly shorter sleeves and the fit is perfect.. It is amazingly wind-proof, being warmer than the quilted jacket it supplants. Overall the quality is very good. I did find a tiny fault in the left pocket where the overlocking has drifted off the edge of the fabric. I trimmed the loose thread away. The cloth is so tightly woven that there is no trace of fraying, but if it should start to fray I will simply seal the raw edge with some PVA adhesive. This is undoubtedly a jacket designed to last. Highly recommended.